Most clinicians enter the behavioral health field because they are driven to help others. Psychologists, psychiatrists and other mental health professionals do not enter the field hoping they’ll face a lawsuit someday. Nevertheless, due to the nature of the job, the possibility of litigation exists. Clinicians might face a malpractice lawsuit or a privacy violation at some point throughout their career. Fortunately, there are ways to prevent malpractice even in complex situations. In this post, we’ll look at the types of lawsuits clinicians commonly face and ways to prevent malpractice in therapy. Part of the mental health profession requires making patients feel comfortable opening up about their most personal concerns, thoughts and feelings. Clinicians must develop a professional relationship with their clients that is built on trust and understanding. A clinician takes on the responsibility of maintaining confidentiality and appropriate boundaries with their patients. Sometimes, this can get complicated. For example, a depressed patient might ask to text their counselor if they have a suicidal thought. The counselor, wanting to help their patient, might agree to communicate with the patient outside of the office. This relationship could potentially develop into something inappropriate for both the counselor and the client and could lead to a malpractice lawsuit in various ways. Generally, if a patient feels they have been violated or treated negligently, they can take several different steps. They might file a complaint with the clinician’s employer, write a bad review about the practice or speak with the clinician about the violation. Or, they might seek legal justice for the harm caused to them, in which case they may recover compensation for the damages. The key to remember is that you must have acted negligently for there to be a malpractice lawsuit. Common complaints clinicians face include relationship boundary issues, sexual misconduct, patient suicide or suicide attempts. Mental health professionals may also be part of a lawsuit involving breaches of patient data or confidentiality. Although there seems to be a myriad of ways to be sued as a clinician, psychiatrists and pediatricians, are the least likely to be sued compared to physicians in other specialties. Any health professional who cares for patients and handles sensitive information runs the risk of litigation, but there are many ways to protect yourself, your practice and your patients from harm. 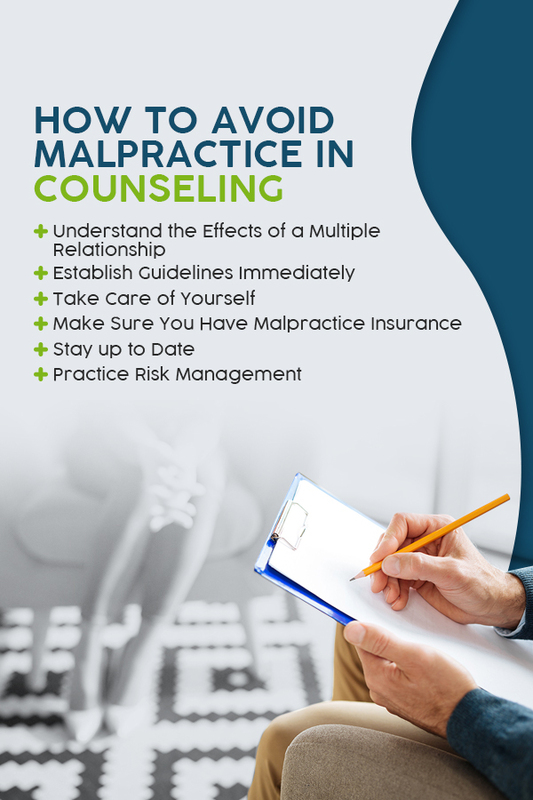 The first step to preventing malpractice in counseling or another type of lawsuit is to know what may lead to a lawsuit in the first place. Here are three types of lawsuits clinicians may face. Medical malpractice lawsuits occur when a patient claims a doctor caused them harm by acting negligently. If a patient wins a malpractice lawsuit, they are awarded compensation for economic loss and pain and suffering. Although the risk of a malpractice lawsuit is lower for mental health clinicians than other types of physicians, the risk is still there. These are not exhaustive lists, nor do the items on these lists guarantee a lawsuit. Again, it must be evident that you did not provide reasonable care to be held liable. Under the Health Insurance Portability and Accountability Act (HIPAA), clinicians are responsible for protecting their patients’ information. However, a patient cannot sue for a HIPAA violation in itself. Instead, they can take legal action against an entity for being negligent or breaching a privacy contract. They have to prove that their clinician did not take care to protect their information from theft or other forms of a data breach. In the event of a HIPAA violation, a patient may file a claim with the Office for Civil Rights (OCR) first. Next, they might contact an attorney to file an individual lawsuit or take part in a class action lawsuit if many patients were affected by the breach to recover damages caused by their data being stolen or released. Hundreds of data breach cases are currently under investigation by the OCR, ranging from laptop theft cases to hacking incidents. Although the data breach laws vary between states, a clinician generally must protect a patient’s privacy. Mental health professionals, in particular, have to keep psychotherapy notes confidential in addition to complying with general HIPAA regulations. Under HIPAA’s Privacy Rule, psychotherapy notes are defined as notes recorded by a mental health professional that document or analyze a conversation during a counseling session. Psychotherapy notes do not include information such as medications or treatment plans — they are the personal notes of a therapist that are usually not required for treatment. A clinician must obtain a patient’s authorization before sharing their psychotherapy notes for any reason with another health professional. One exception to this rule is if the notes would help prevent a harmful situation, or if the clinician needs to report abuse. Psychotherapy notes must be kept separate from medical records. If a psychologist releases information without a patient’s consent, unless it is to protect the client or public from serious harm, there could be a lawsuit. If a breach would occur, covered entities, such as psychologists or psychiatrists, must comply with HIPAA’s Breach Notification Rule. This rule says that the entity must notify the affected individuals, the Department of Health and Human Services (HHS) and possibly the media. Knowingly sharing confidential information without a patient’s consent could also lead to a lawsuit. Physicians must also report and return Medicare overpayments to the government 60 days after the overpayment was identified. Usually, patients are not the ones to report false claims. An employee, former employee or a competitor may inform the government about false claims. One example of a false claims lawsuit involving a behavioral health clinician was the case of Dr. Erum Shahab. Shahab, a psychiatrist and owner of a psychiatric medical practice in Connecticut, regularly conducted urine drug screening tests on patients being treated for substance abuse disorder. Shahab submitted claims to Medicare for multiple units of urine drug screening even though only one unit of service could be billed per patient encounter. Shabab’s practice received hundreds of thousands of dollars from the Medicare program as a result. To resolve allegations of violating the False Claims Act, Shahab and his practice agreed to pay the government over $800,000 — the amount needed to cover the false claims. Most clinicians want to avoid a malpractice lawsuit at all costs. When a patient sues their doctor, the physician may undergo extreme stress. A clinician facing a lawsuit may first experience a sense of shock, followed by anxiety, anger and dread. According to the Western Journal of Medicine, more than 95 percent of physicians experience emotional distress during the litigation process. If found guilty of malpractice, a clinician could lose their license. Here are six ways to prevent negligence and malpractice in therapy. A multiple relationship describes a clinician who fulfills several roles for a patient. In other words, they are a professional health care provider, as well as a friend outside of the office, or maybe an employer. A counselor or clinician is also considered to a have a multiple relationship with a client if they promise to enter another relationship with the person in the future. A multiple relationship is not necessarily grounds for a malpractice lawsuit. However, if the relationship impairs the clinician’s objectivity or effectiveness as a professional — or if the relationship causes the patient harm — it could lead to a lawsuit. If a clinician realizes a multiple relationship exists, they may take reasonable steps to end the relationship keeping their patient’s health in mind. As a mental health professional, it’s important to consider the effects of a multiple relationship and how it may impair objectivity before fulfilling more than one role for a patient. The first time you meet with a patient, make sure you set boundaries from the start. Let them know what they can expect of your services and what you will and won’t do. For example, a patient might expect to contact you via social media when they experience a difficult situation. However, by agreeing to this, you make yourself vulnerable to a privacy violation. You have no way to know for sure you’re speaking to your client through social media or texting. Set clear communication rules and make sure your client understands them and their purpose. Mental health professionals face a lot of stress with the job. If you’re experiencing life stressors in addition to your workload, you may feel overwhelmed and not act according to your best judgment. This may lead to inaccurate documentation, or sharing too much personal information with a patient. Medical malpractice insurance covers liability resulting from a medical malpractice lawsuit. As a clinician or mental health professional, it’s recommended to have coverage for yourself, your business and your employees. Malpractice insurance does not cover liability from sexual misconduct or criminal acts. Staying current on the newest laws and information about malpractice risks, license requirements and patient care will help prevent malpractice. Research psychological associations in your state and consider becoming a member. As a member, you may also receive guidance on malpractice issues and the latest information about the assessment and treatment of patients at risk of suicide. Documentation is the primary evidence used in a malpractice trial. Therefore, it’s imperative to prioritize complete, accurate documentation. If a patient files a lawsuit, documentation may prevent the case from proceeding. Your records can be used to prove that you provided reasonable care and made careful judgments when treating your patient. Clinicians want to provide the best care possible for their patients, and they also want to avoid a lawsuit. ICANotes can help ensure your documentation accurately represents your thoughtful, reasonable care and makes it easy to prioritize complete documentation. ICANotes is behavioral health EHR software with a user-friendly interface designed to reduce documentation errors and simplify access to patient history. With ICANotes, you can easily review a patient’s treatment plan, mental health history, medications and more before they arrive. ICANotes also helps you maintain compliance with HIPAA regulations and takes the worry out of confidentiality rules. To learn more, watch a live demo or register for our upcoming webinar, “Tips and Tricks to Avoid a Lawsuit,” on Wednesday, April 24th, at noon.